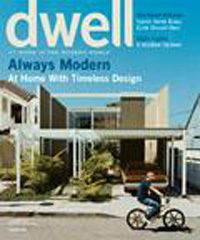 The July/August issue of "dwell - the magazine for modern living, features an article mentioning The Prisoner. Page 146 gives prominent mention, in an article titled Eero Dynamic, to the famous Ball Chair of designer Eero Aarnio and to it's unique role in Prisoner history. The opening page of the article also shows a young Aarnio seated in a Ball Chair, which of course can be seen in The Prisoner as the chair used by the Number Two characters in The Green Dome in the series. More details on the article and mag HERE.